A blizzard is coming—as least it is in our neck of the woods. The meteorologists are predicting more snow in the next two days than I’ve seen at one time in my whole life. Groceries have been purchased, schools have been cancelled, and hatches have been battened down. And what could be better on an extraordinarily snowy day than curling up under a toasty blanket and reading a good book with the little person in your life? So here are a few of my snowy day favorites, in all shapes and sizes (and age ranges)! Ezra Jack Keats, The Snowy Day: Sure, this one is a no-brainer, but only because it is so enduringly wonderful. As a former city kid, seeing Peter venture out into the cityscape transformed by snow is nearly irresistible. And when he finally finds the kid across to hall in the end to share the snow with, it’s a thing of beauty. Lovely to look at, fun to read. 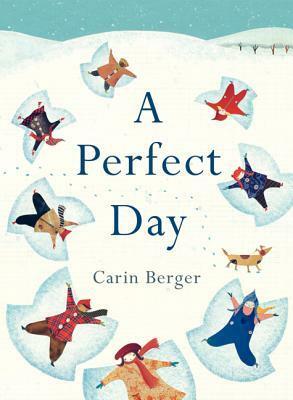 Carin Berger, A Perfect Day: Gorgeous snowy artwork overlays handwritten notes as seeming an entire town’s worth of kids come out to frolic in the snow. At the end of the perfect day, there are warm hugs and even warmer steaming mugs of hot chocolate—and the promise of another perfect day in the snow tomorrow. A new favorite! Virginia Lee Burton, Katy and the Big Snow: Just because Geoppolis has had a blizzard’s worth of snow dumped on it doesn’t mean that life stops, and that people don’t still need to get places. Only Katy—tractor turned strong plow—can dig everyone out and get whole town running again. Girl power on the tractor level, and Virginia Lee Burton’s artwork to boot—it’s a winner. Jean Little and Jennifer Plecas, Emma’s Magic Winter: Another new favorite, this sweet and gently funny tale of shy Emma finding her voice—with a little help from a new neighbor and their matching “magic” snow boots—has won over hearts in my house. Perfect for young independent readers, with a message about overcoming one’s fears that comes with a spoonful of sugar, and lot of fun in the snow. Jennifer Armstrong, Shipwreck at the Bottom of the World: Looking to share your obsession with Ernest Shackleton with the young person in your life? Wait, you’re not obsessed with Ernest Shackleton? This book will make you a convert. Details abound about this ill-fated trip of Antarctic exploration in which the ship got smashed on ice, the entire crew had to set up shop on the ever-moving ice—and not a single life was lost. Illustrated with some of Frank Hurley’s original photography from the ordeal, this also features some pretty awesome storytelling. 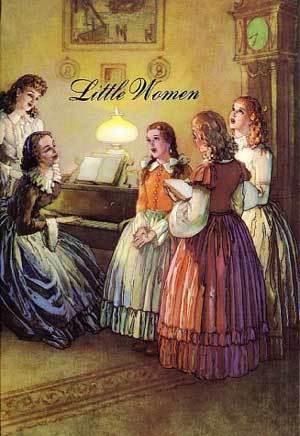 Louise May Alcott, Little Women: Hey, the blog is named after Jo March. You had to see this one coming. The whole book is pure gold, but the wintery scene in which Jo first becomes friends with the ailing Laurie practically glows. Perfect with a warm beverage and someone who likes to snuggle up as you read aloud to them. For everyone facing the storm today, bundle up, stay safe, and have fun!